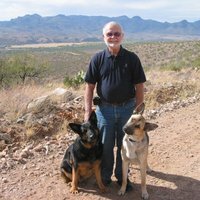 Retired from the Commercial Industrial Insurance field, part time RVer, married and live in Rio Rico Az- Member of the Rio Rico Rotary Club. 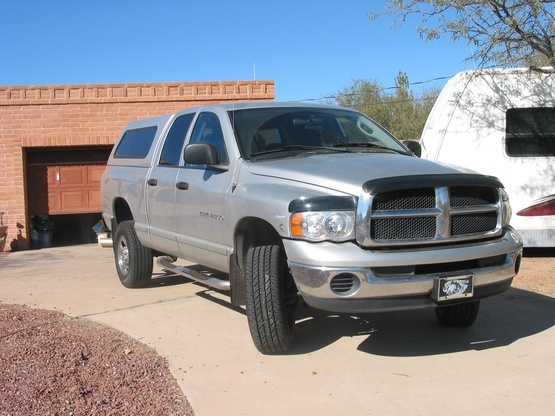 Native Californian, after retirement sold our home and moved to Rio Rico Az. 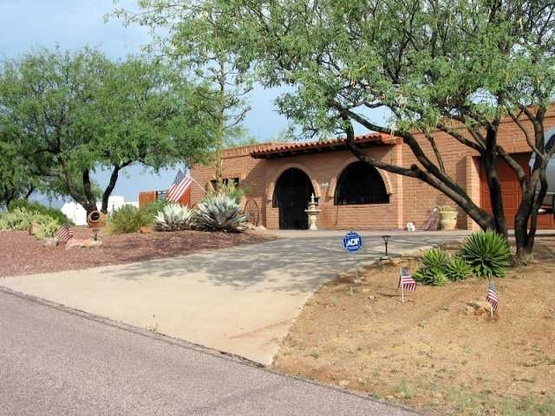 A rural, hilly area of Southern Az Elevation is 3800 feet and the climate is great. Max temperature in the Summer is 100, and the minimum is about 20 which last for only a few days. We are 14 miles North of Nogales AZ and in spite of the hype from the news media, we feel very safe. My wife Alice and I have lived here on our 2 acres for a little over a year. We have 5 cats and 2 German Shepherds. The dogs are RVers too. From time to time we could have space for one rig with water and electric available We could accommodate up to a 32 foot rig. Our family of many is located in Southern California with a Grandson,formerly a Captain in the Marines, was stationed in Afghanistan. Now a practicing attorney. Thank you, Alice, Art and your wonderful, friendly dog Ranger for hosting us the night. We appreciated the nice conversation and your wonderful sense of humour. Our dogs are missing you. Really enjoyed ourselves & our host was excellent. Highly recommended. It was easy to find this stop. Art did not aspect us so early but it was alright. He is a very friendly host and helpful. The view was fantastic. We highly recommend this host. We had a wonderful stay with Art and his wife Alice. They were very accommodating during our stay and we even had a wonderful dinner, at a local restaurant, with 2 of their friends. From our campsite we saw roadrunners, Javalina and all sorts of bird life. If ever back in the area, and need a Boondocker site, we would not hesitate to stay here again. How did he do that? How did Art provide a full family of wild Javelina to appear in their front garden for us to see on our first evening here, after we’d told him we’d never seen any before, during all our trips in the Arizona boonies! And Alice provides free non-stop dining for a myriad of colourful wild birds. Once, they all disappeared, to be replaced by a Gray Hawk dropping by for inspection! All within feet of our RV window! We seemed to see more close-up wildlife here than weeks out in the wilds! We temporarily adopted a blue hummingbird. Art had great communication with our initial contact and stay arrangements, and was full of useful information. Note also: very safe here! Great place, great experience, well recommended! We stayed 2 days at Arts location, very cordial host, and great guy. Pad beside the house was good , and we were given electrical hookup, much appreciated. We would definitely stay again if in the area, and would host Art and his wife if they came to Canada! Awful Art is a very nice gentleman ! Don't tell him that I said so ! Great spot on circular drive. Many birds and even javelinas for company ! Very secure. Beautiful setting in desert hills. A delightful stay before crossing the border into Mexico. Art was easy-going with my changing arrival dates and times. He was kindly available to answer questions and provided great local references for services needed before crossing. Nogales is a wonderful crossing, by the way. Friendly, pleasant, efficient. The best of my 5 crossings made with a vehicle. Thanks, Art, you helped me to have a good start on my first RV camping in Mexico. As a solo woman traveler, is much appreciated ! I had a wonderful 7 days camping on my way to San Miguel. Stayed over night on my way back from a camp trip. It was higher than expected temps and my host offered electric so I could cool down my trailer with the a/c. Also, I was able to put my big dog in the fenced back yard so he could rest and cool off---I appreciated that part so so much! Host gave me some reading material about the area and made me hot coffee early in the morning for my trip back home. Very accommodating. Thank you so much! A very nice spot overlooking the valley. Flat and quiet. Even a bird feeder out for our own private birdwatching ! Art was very helpful with local info, and we were especially thankful for the cold beer on arrival! Thank you to this fine gentleman - a great host. Awoke to beautiful sunrises in the hills after a restful sleep. As stated previously - not for larger motorhomes. Art and Alice give us an very nice welcome, we had a nice chat and they give us an very good advice for my problem with my glasses. We got an nice dessert and an few good magazines. We were very happy to stay on this place. Windy, hilly road to get there but a great view upon arrival. We enjoyed an overnight stay with AwfulArt and came to realize he is AwsomeArt, instead. He explained that his handle goes back to younger days. A great host with a wonderful view of the Rio Rico valley from his hillside location. For us, it was convenient and easy to reach on paved road, but the hills and curves may be a challenge for larger rigs or 5th wheels, unless you are skilled at maneuvering. Art has a small parking area where he used to store his 5th wheel trailer, before selling it. Fairly level but slopes a bit toward the hillside. Rather than park there and block our wheels up, we just parked on his cement driveway for the evening in our 20ft Roadtrek. Good guy and we enjoyed our brief visit with him while passing through lower Arizona on way to Nogales, Mexico. Art & Alice's site has a lovely view down over Nogales but rigs that are longer than 32-34 ft. may have trouble accessing the site. We tow a 36' Fiver and it was a challenge getting there, due to the steepness of the approach to the parking spot but, once there its was wonderful. If tight turns and precipitous corners intimidate you, be wary. Art & Alice are gracious hosts and if you're a Rotarian try and join Art at their club's sunrise meeting on Tuesdays. Thanks Art & Alice. Awful Art is an awesome guy !! We stayed with Art on our way into Mexico while making the Nogales, Az crossing. Art has a Beautiful home with a beautiful view of the valley below. Art is very hospitable and helpful and we enjoyed chatting with him. His name should be Awesome Art because he is such a nice guy.